With Perpetua CMS, adding text couldn't be easier. Navigate to a page, select Add Content in your Perpetua Toolbar, and select the Content Box. (In many cases, modules like the Content Box cannot be added to the homepage). Header - you will find this in most modules. This feature allows you to set a title for the Content Box that will display above the body text. It is usually a larger font and a different color from the body. To edit the color, font-size, set a link, or change the background color, click the (+) next to HEADER. Some clients may also have the option to set CB Styles, depending on the design of your website. To learn how to set these styles across your entire website, visit Editing Styles. Body - this is where the actual content of the Content Box is added. Like the Header, you can edit the defaults for the Body section by clicking the (+) next to BODY. Below this, there is toolbar. This toolbar is similar to most text-editing software. You can make text bold, italics, and underlined, align text, paste plain-text, create lists, and add images, links, anchors, and symbols. For more information on these options, see Editing Text. 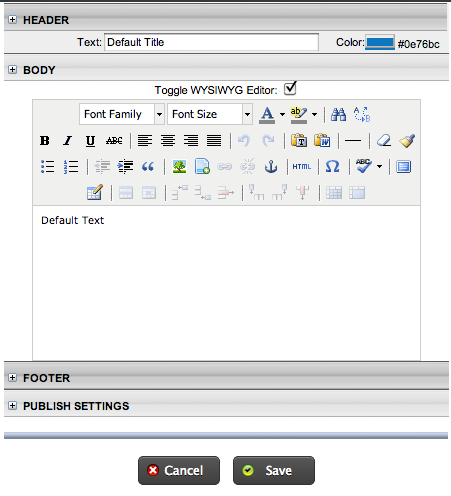 Footer - If CB Styles are enabled on your site, then you may have the ability to set the Footer CB Style.